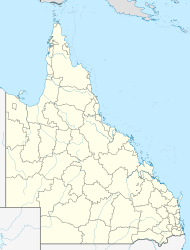 Maroochydore is a suburb of the Sunshine Coast, Queensland, Australia, and is the central suburb of the Maroochydore urban centre. Maroochydore contains a popular surf beach. The Maroochy River's southern bank forms a virtually unbroken stretch of parkland and picnic spots in the area known as Cotton Tree. An oceanway encourages sustainable travel by pedestrians and cyclists along the beaches. Maroochydore is also a major commercial area of the Sunshine Coast with most shopping precincts located in the central business district. It is home to the Sunshine Plaza shopping centre and the Sunshine Coast's major bus interchange for TransLink services on Sunshine Coast. ^ Australian Bureau of Statistics (27 June 2017). "Maroochydore (State Suburb)". 2016 Census QuickStats. Retrieved 18 April 2018.